SRINAGAR, July 4: Governor, N N Vohra today chaired second meeting of the State Administrative Council (SAC) at Raj Bhavan. Advisors to Governor, B B Vyas, Vijay Kumar and Khurshid Ahmad Ganai, besides Chief Secretary, B V R Subrahmanyam attended the meeting. The SAC called for taking a series of prompt and tangible measures to give a determined push to the developmental efforts and improve delivery of governance in the State under renewed “Mission for Delivering Development”. The SAC meeting, chaired by Governor N N Vohra, here this afternoon, discussed various measures to be taken in a “Mission Mode” to fast-pace delivery of development and make a shift from outlay to outcomes. It also discussed the initiatives to be taken to ameliorate overall governance so that the people at large are benefitted through improved and effective delivery system and results are visible on the ground. The SAC asked the Chief Secretary to work out the modalities and oversee the renewed “Mission for Delivering Development” which, inter-alia, would include setting up of dedicated cell for regular monitoring of progress of the identified mega projects, flagship programmes, major schemes, projects under PMDP, other major projects of Government of India and ensuring proper expenditure management. The reinforced administrative apparatus to be put in place to ensure timely and productive implementation of the developmental initiatives through “Mission Mode” would also include strengthening the public outreach and Grievances Redressal Mechanism to ensure regular feedback from the targeted population. The modalities would also focus on streamlining various individual administrative matters such as recruitment rules, promotions, pensions/benefits, contractual appointments, fast-pacing recruitments, finalizing seniority lists, submission of APRs, property returns, personnel complaints, regularization, fast-tracking of departmental enquiries and a cell for auditing institutions with regard to their performance, staffing and financial condition. It would also include strengthening the anti-corruption mechanism at various levels. The SAC directed that proposals in this regard should be finalized immediately by the concerned Departments and submitted through the Chief Secretary. The SAC accorded sanction to the creation of 29 posts of Readers Grade-I, 58 posts of Readers Grade-II, 23 posts of Senior Stenographers and 21 posts of Junior Stenographers in the subordinate judiciary to implement the recommendations of Shetty Pay Commission for the staff of subordinate judiciary and to implement the directions issued by the Supreme Court in this regard. With the creation of these posts, Jammu and Kashmir has fully implemented the recommendations of the Commission for staff of subordinate judiciary which include their career progression and grant of allowances etc. at par with their counterparts in other States. The SAC also accorded sanction to the enhancement of remuneration/honorarium being paid to Research Assistants in Jammu and Kashmir High Court from Rs 15000 to Rs 25000 per month. The move will bring their honorarium/remuneration at par with their counterparts in other High Courts of the country. It approved diversion of 29.90 hectares of forest land in various parts of the State for undertaking developmental activities in the Railways, roads, drinking water and other sectors. The proposals were recommended by the Forest Advisory Committee (FAC), headed by the Chief Secretary in its 106thmeeting held on 20.04.2018. The projects approved for use of forest land include construction of foundations of bridges, tunnels etc of USB Railway Line project in Reasi and Mahore Forest Divisions, construction of road from Banjian to Nokanin Billawar Forest Division by PMGSY, construction of 0.25 lakh gallon filtration plant at Chandanwari and 0.40 lakh gallon service reservoir at Nunwan by PHE in Lidder Forest Division, Bijbehara and construction of Operational Track (Road) from Maidan Behak to Ringsar (K17.00 to Km 27) in Kamraj Forest Division. The SAC approved procurement of latest Cleaning machines by J&K Lakes and Waterways Development Authority (LAWDA) for 4 basins of Dal-Nagen Lake, through global tendering process. The matter of augmentation of mechanical resources of the Lakes Authority has been pending for a long time for want of decision making. The SAC while appreciating the ground realities including excessive weed growth, macrophyte infestation and massive expansion of lily patches in the open water expanse of Dal-Nageen Lake, has promptly responded in the matter raising hopes of lake conservation. The SAC emphasized that the pristine glory of all water bodies including Dal-Nageen lake has to be restored and every effort shall be made to arrange the financial and mechanical resources for effective and timely management of lake cleaning operations. It is pertinent to mention here that most of the available machines with the LAWDA have outlived their utility life and are being operated beyond their working capacity. The withdrawal and re-deployment of these machines from one to another basin of a 25 Sq. Km lake area has been severely impeding the working efficiency and reducing the net progress. While recognizing the fact that the procurement of sophisticated top end aquatic machines may take few months, as an interim measure, the SAC gave nod to LAWDA for hiring of lake cleaning machines up to March 2019, so that the lake ecology does not get affected adversely due to excessive weed growth and macrophyte infestation. 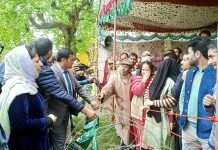 The SAC accorded sanction to the establishment of public library at Tujjar Sharief, Zainagir, district Baramulla along with creation of 2 posts. 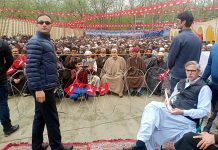 A cross section of the society of the area including students, scholars, researchers and general public had been demanding establishment of Public Library at Tujjar Sharief. The establishment of Library will help students, scholars and researchers as well as retired officers/officials. This will be a Government owned Library with the Library Department. The SAC also directed the Libraries Department to bring a Public Library Policy before it in the next four weeks. The SAC gave nod to the enactment of the ‘The Jammu & Kashmir State Trust for Welfare of Persons with Autism, Cerebral Palsy, Mental Retardation and Multiple Disabilities Bill, 2018″ and ‘The Jammu and Kashmir Drugs and Magic Remedies (Objectionable Advertisements) Bill, 2018’. The Jammu & Kashmir State Trust for Welfare of Persons with Autism, Cerebral Palsy, Mental Retardation and Multiple Disabilities Bill, 2018 aims at empowering persons with disabilities, to live independently by providing them support, extending support to registered organizations to provide need based services to families of persons with disabilities, promoting measures for care and protection of such persons and realization of equal opportunities, protection of rights and full participation of persons with disabilities. It will leverage various Centrally Sponsored Schemes/ Programmes and will be beneficial for their rehabilitation, education, skill development and effective participation and inclusion in society. The Jammu and Kashmir Drugs and Magic Remedies (Objectionable Advertisements) Bill, 2018 aims to put a check on misleading advertisements for certain purposes of remedies alleged to possess magic qualities which directly or indirectly gives a false impression regarding the true character of the drug or makes a false claim for the drug or is otherwise false or misleading in any manner. In the year 1954, the Government of India passed Drugs and Magic Remedies (Objectionable Advertisements) Act, 1954. The Act extends to whole of India except the State of Jammu and Kashmir. The State Health and Medical Education Department mooted the proposal for enactment of legislation similar to the Central legislation.